The most complete boilerplate app on the web. Like the project? Give it a ! 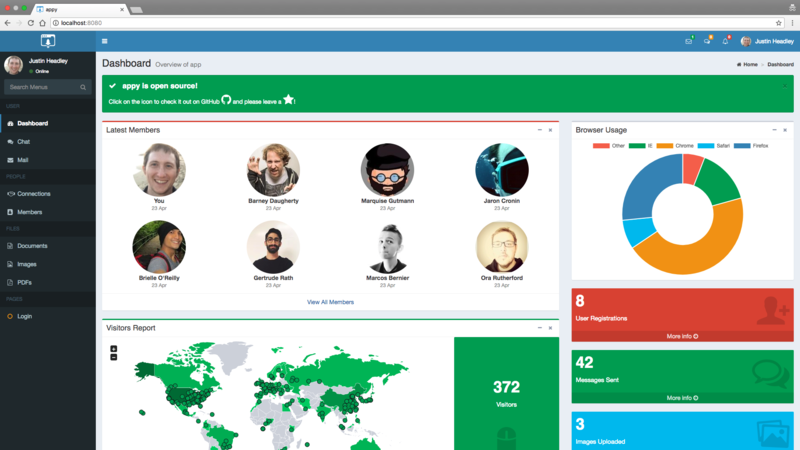 An open source web app targeted for mvp development. The goal of appy is to provide you with some of the most common features and functionality found in modern web apps. Use it as a launching point to build out your own app, or simply as a learning tool to understand how technologies integrate. Now you can test out your ideas faster than ever! Aesthetic UI components based on the popular AdminLTE template. Login flows and Authorization utilizing roles, groups, and permissions. Easy endpoint documentation and testing through Swagger UI. Real-time features such as notifications and chat. Connect with and follow other users. Shareable docs and image uploads. Disable users, update permissions, and query audit logs. Vue frontend, hapi backend, MongoDB datastore. Built with modern tech and design principles, the front end is fully responsive and provides tools such as hot-reloading and reusable components allowing you to adapt appy to your mvp needs. The robust backend features auto-generated endpoints based on data models allowing for rapid API development. 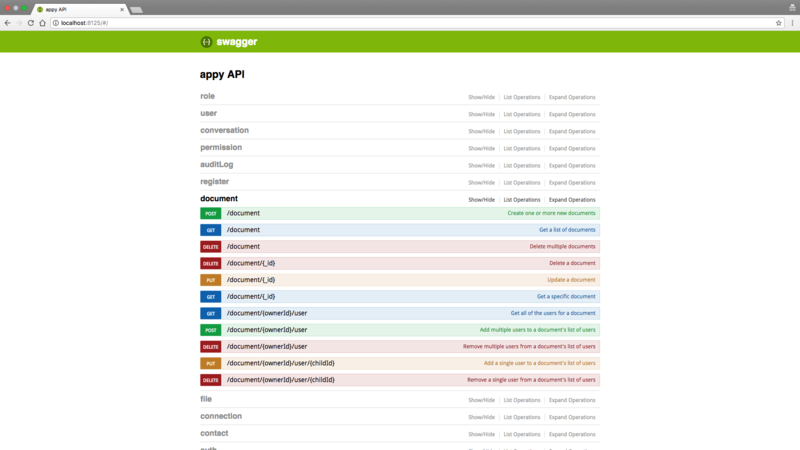 Built in swagger plugins make API testing and documentation a piece of cake. Test appy for yourself! Create an account , login with a social network , or try one of the demo accounts below. User They're everywhere! Users have access to all the standard features. Try It! Admin Taking care of business. Admins can manage user permissions and view audit logs. Try It! Super Admin The big boss! A super admin has access to all views and actions. Try It! You can also view the live swagger docs here. © appy 2017-2018. Design: HTML5 UP.